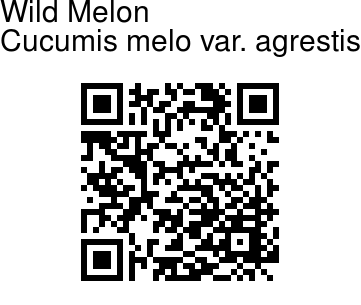 Wild Melon is an annual climber growing up to 1.5 m. Stem are generally covered with rough hairs. Leaves are triangular, ovate, 3-5-lobed, rough with rigid hairs. Leaf stalk is 1-6 cm long. Flowers are small, yellow, solitary or rarely in pairs or threes. Flower clusters are carried on stalk 5-10 mm long, densely hairy. Sepal is about 1.5 mm long, subulate. 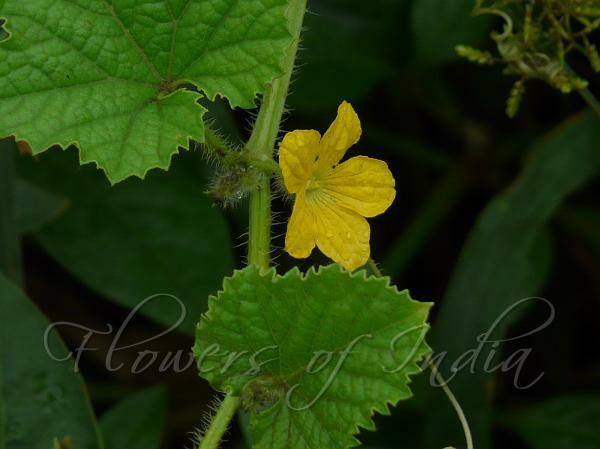 Flowers are 6-8 mm long, with petals ovate-oblong. Fruit is ellipsoid, oval-round, sometimes obscurely trigonous, smooth and hairless, 4 x 2.5 cm, generally with dark green stripes, looks like a miniature watermelon. Fine powder of dried "Kachri" is the best natural meat tenderizer. Minced meat for seekh-kababs is mixed with Kachri powder, and left for 4-6 hours to make it tender. The fresh fruits are also made into chutney, which has a tangy taste. Flowering: July-November. Identification credit: Dinesh Valke Photographed at Ghodbunder Road, Thane, Maharashtra and Sundar Nursery, Delhi.